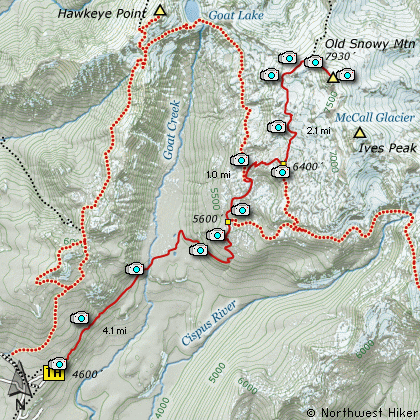 This is one of the most popular hikes in the Goat Rocks and after you've completed this journey, you will know why. This hike begins at the same trail head as the Snowgrass Flats hike and follows the same trail to Snowgrass Flats. Then you follow the cut-off trail that takes you to the Pacific Crest Trail above Snowgrass Flats. Upon reaching the PCT, you follow it north until you reach the pass on the northwest flank of Old Snowy itself. From there you follow a users trail to the top. You are likely to encounter alot of other ambitous hikers, but this should not destract from the awesome beauty around you. If you can hike this in mid July to early August you will be treated to incredible floral displays with a few not so friendly insects who attempt to distract you for the beauty of your surroundings.